Howard Brown, a well-known face to millions, announces his ‘switch to Ulster Bank’ by launching the bank’s new switching campaign. 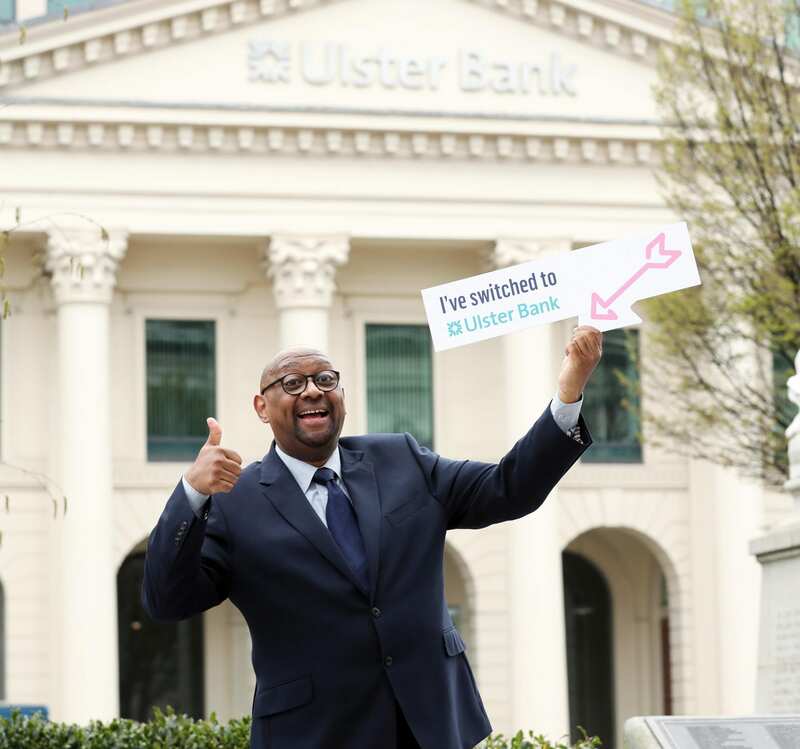 The Birmingham-based former bank worker and TV star is in Belfast to launch the initiative, which offers £175 to those who switch their current account to Ulster Bank. Howard has been hired today by the bank to help communicate the benefits of switching, including the cash bonus. He is pictured today in Belfast city centre. In addition to making an appearance in Belfast city centre today, he also travelled to Ulster Bank branches in Lisburn, Newtownards and Antrim to spread the word. Howard said: “Aside from the obvious fact that this is a great offer for people to switch to Ulster Bank, I couldn’t turn down the opportunity to work with the legend that is Henri Hippo!”. Ulster Bank is offering £175 to new and existing customers switching their main bank account. The time limited offer is now available and runs until 17th May 2019. This is the highest switching incentive the bank has ever offered. The £175 will be split into two payments, £125 after the first few months and a further payment of £50 once the account has been open for a year. Switching bank accounts is simple and can be done through the Current Account Switch Service. Payments, such as Direct Debits and Standing Orders are automatically transferred to the newly opened account within seven days. An account can be opened on ulsterbank.com or in any Ulster Bank branch. Switchers are required to use the Current Account Switch Service, close their existing account and transfer their main current account to Ulster Bank. Customers will then receive £125 by 12th July 2019 and if they remain a customer after a year and meet the terms and conditions will receive a further £50. It is simple to obtain the switcher offer. Customers must pay in £1500 to the account and customers need to log into online or mobile banking through the Ulster Bank mobile app before 17th June 2019. Customers must be 18 or over and must not have received a cash offer from Ulster Bank, Royal Bank of Scotland or NatWest for opening a new current account and switching after October 2017.